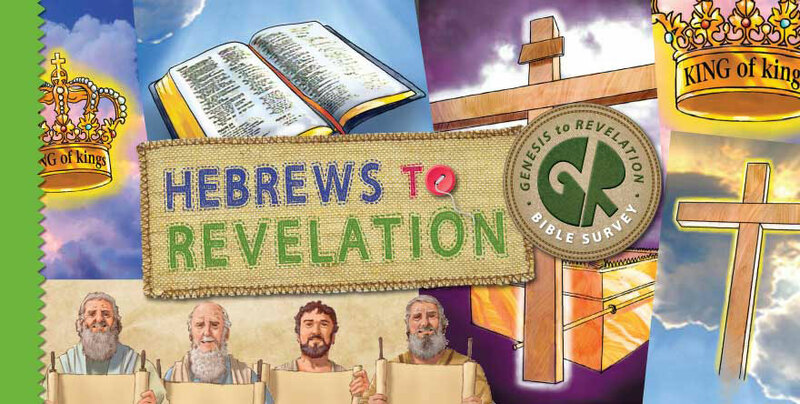 In Hebrews to Revelation, the final G2R Bible Survey study, we wrap up our journey through the Bible by focusing on the last nine books of the New Testament. Click here to see the master plan. This study covers eight General Letters, Hebrews through Jude, and the final book of Prophecy, Revelation. James, Peter, John, Jude, and an unknown author wrote the eight General Letters of the New Testament. Two apostles, two brothers of Jesus, and an unidentified Christian leader wrote to the early Church, explaining essential doctrines of the faith and urging these new believers to stand strong against false teaching while growing in holiness. Your students will see very clearly how Jesus fulfilled the Old Testament promise of the Messiah. In Revelation, the apostle John wrote the message given to him by Christ himself. The apocalyptic book describes the ultimate victory by our Lord and Savior Jesus Christ. As your preteens and young teens study these books, they will learn how to live as God’s chosen people as they look forward to Christ’s return. As you go through these final 13 lessons, you are helping your students see how they fit into God’s redemptive work among his people and how these books are part of God’s single story of salvation from Genesis to Revelation. By God’s grace, they will gain a deeper hunger and thirst for God’s Word and a greater love for and trust in its Author. Remember that this is a survey—an overview—not an in-depth study. Don’t get bogged down in the details. Try to do a lesson a week to keep your students interested and growing. Read the Getting Started Guide (pp. 8–12 of the Teacher Manual) and then each of the Preparing Your Heart sections to get a good overview of the scope of the 13 lessons. Then begin the exciting adventure!